Girl: Grandpa, what’s the damnedest thing you’ve ever seen? 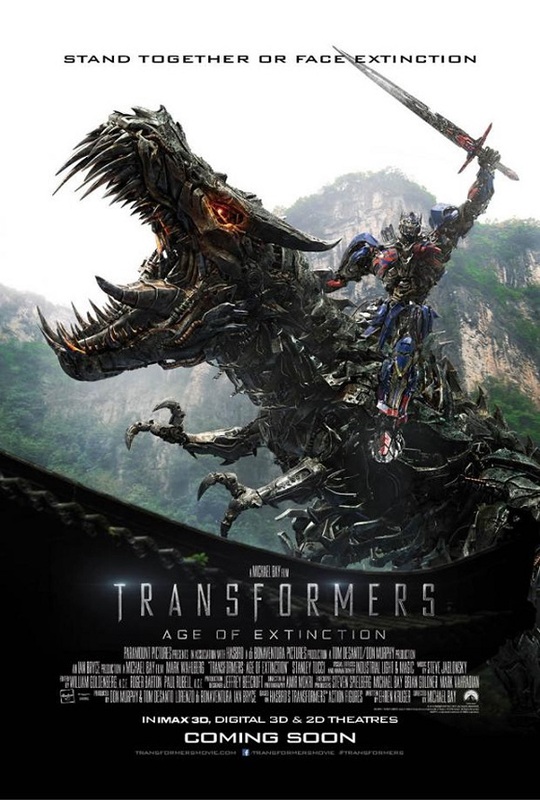 Me: Oh, it’s definitely the poster for Transformers: Age of Extinction, where the main hero, Optimus Prime, is carrying a sword and riding on the back of a robot dragon. Girl: You mean the one hanging over the fireplace right there? Me: That’s the one. Now be a doll and get your grandfather another eight fingers of bourbon. Michael Bay’s latest giant robot adventure, Transformers: Age of Extinction, is now less than two months away. While you normally think that a big, tentpole movie like this would have all of its ducks in a row, so to speak, by this point in the game, that doesn’t mean every last bit is in place. In fact, two notable actors have just joined the party. Reports say that both John Goodman and Ken Watanabe have been added to the cast in voice only roles. This news comes directly from Bay’s website. In an era in Hollywood where secrecy is king—just think of the layers of security surrounding every last detail for movies like J.J. Abrams’ Star Wars: Episode VII and Christopher Nolan’s Interstellar—the report actually says exactly what characters each actor will play. If Michael Bay’s Transformers: Age of Extinction doesn’t close out the summer as the highest grossing movie of the blockbuster season, a lot of people are going to be very surprised. And that’s regardless of whether or not it’s any good or whether or not critics savage it. Over time, the films have proven entirely immune to reviews and have raked in billions of dollars around the world. In that spirit, we have a new Japanese trailer, complete with a half-hearted sounding introduction from star Mark Wahlberg. This video plays like a more stripped down, action packed version of the official American trailer. In large part this strips away all of the superfluous stuff—you know, like story and character—and show you what you came to see, giant robots fighting giant robots, and that’s okay with us. The movies have never been known as a bastion of stellar character work or for displays of acting chops. And you have to worry that Stanley Tucci is going to hurt that bit old robot’s feelings when he tells the Transformers that we, as humans, no longer need them. 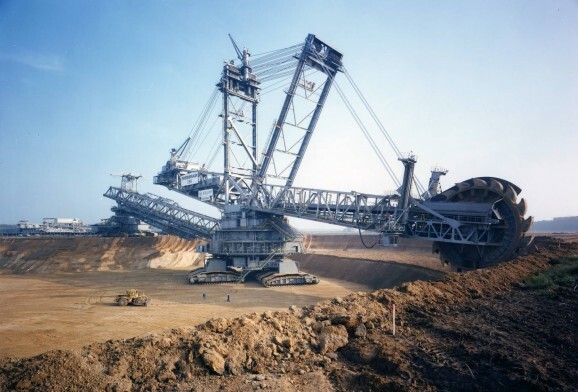 The Bagger 288, also known as the Excavator 288, is the largest land vehicle in the world. Somehow, I hadn’t heard of it until now—probably because it’s hanging out in Germany, where it was built by Krupp AG, one of the biggest steel and arms manufacturers in the world through World War II when it then switched to making industrial machinery. The Bagger was completed in 1978, and surpassed NASA’s Crawler-Transporter as the most massive terrestrial vehicle known to man, weighing in at 13,500 tons. Here’s the real thing, which inspired a music video that will leave you scratching your heads, it also features a bunch of animals head banging to its sheer awesomeness. We all know that director Michael Bay’s Transformers: Age of Extinction is going to be a huge hit this summer. And now that we know for sure it’s the start of a new trilogy, there is going to be a ton more robot action in our future. Even though Paramount could probably just dump a new Transformers movie in the theater and bring in an absurd amount of money, that’s never stopped them from going all out on the promotion end of things. Last night, during the MTV Movie Awards, the studio debuted a new TV ad for Age of Extinction, and today they’re right back at it with three new photos. This video plays like many of the other spots and trailers we’ve seen. It introduces us to the new hero of the franchise, an inventor/mechanic named Cade, played by Mark Wahlberg. As indicated, some time has past since the last movie, Dark of the Moon, and Transformers themselves have, apparently, become a thing of the past. We’ll get to the reality of that claim in a moment.